Miley Cyrus and Shawn Mendes are the musical gift that keeps on giving. After the pair honored Dolly Parton with a beautiful performance at the MusiCares Person of the Year gala in LA on Saturday, they took the stage again at Sunday night's Grammys to perform a stunning rendition of Mendes's hit, "In My Blood." 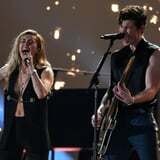 Mendes hit the stage to perform the first half of the Grammy-nominated song on his own, accompanied by a piano, and he was later joined by Cyrus, who helped him kick things up a notch for the crowd. "In My Blood" was nominated for song of the year, while Mendes's self-titled album received a nomination for best pop vocal album. Mendes and Cyrus have been spotted together multiple times over the last few days, and after tonight's performance, we can only hope that there's a collaboration in the works. See more photos of their performance ahead.